Jenna Lee Rude is an LA-based health coach, choreographer and dancer. 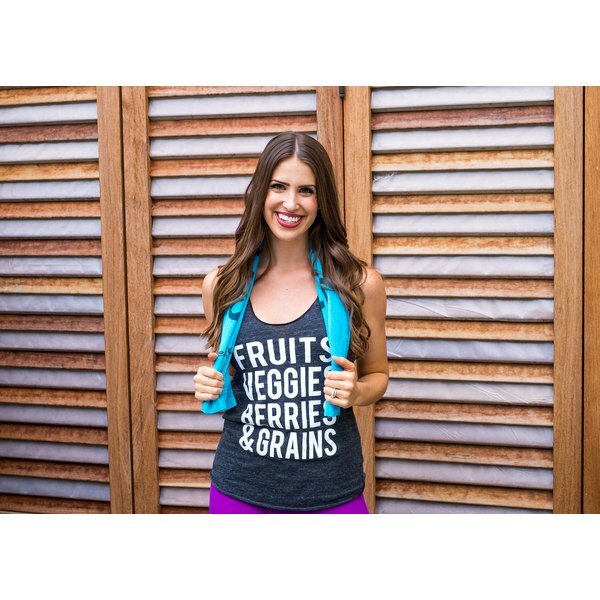 She frequently tours the country talking about nutrition, wellness, entrepreneurial success and leadership, and she's been featured as a leader in the millennial wellness movement in publications such as Girl Meets Strong. She's beautiful inside and out, and her all-natural take on beauty is so inspiring, it makes us want to detox our own beauty routines. Today, she talks about the skin care products she uses daily (they're organic, vegan and 100% natural! ), the chemical-free lipstick she loves and the simple secret to getting gorgeous hair. First, I wash my face with Urban Oreganics Cleansing Grains. Then, I spritz on Urban Oreganics Rose Water Toner and moisturize with Everyone 3-in-1 Coconut & Lemon Lotion, which I LOVE because I can use it for my hands and body as well. I'm all about keeping my routine simple. I also take two orchard, two garden, and two vineyard Juice Plus+ whole food concentrate capsules with a big glass of water. True beauty comes from within and your skin is a window into your overall health. Staying hydrated and flooding your body with whole fruits and vegetables is the key to healthy, glowing skin. I have naturally oily skin, and due to my active lifestyle, I am usually getting my sweat on multiple times a day. So, I love bareMinerals barePRO Performance Wear Powder Foundation because it's a 12-hour wear foundation that's formulated with 90 percent vitamins and minerals for flawless coverage. I also use bareMinerals concealer, mineral veil, blush and bronzer products. For eyes, I love Anastasia Beverly Hills Brow Wiz and I'm addicted to MAC In Extreme Dimension 3D Black Lash Mascara as well as pretty blush, brown, and neutral shades of MAC eye shadow. My go-to brow and makeup guru is Suzie Moldavon of FlyBrow. I would die without her brow taming skills and advice on all things beauty. For lips, I love Beautycounter Lip Sheer in Currant for a more dramatic look or Twig for everyday use. I choose Beautycounter because you are what you eat and eating chemical filled lipstick is not for me. Period. Tell us, how do you get such gorgeous hair? By eating fruits and vegetables of course! No, I'm actually serious. Plant food makes your hair shiny. I have never, ever colored my hair because it naturally lightens up in the summer with the sun, so by the end of the winter, I get a natural sort of ombre look which I love. My favorite hair products are all things Aveda especially their Shampure shampoo and conditioner. I love my hair the most in the summer when I can let it air dry and use Olivine Atelier Love + Salt Spray to get volume and beachy texture without having to do anything. I give myself plenty of time to get ready so I'm not rushed. I really enjoy a good primping party with my girlfriends, country music blasting and a glass of wine. I curl my hair on the outside of a normal curling iron barrel to get that celebrity-beachy-wave look, shake it all out, and then tease at the roots. If you love curling your hair, make sure to invest in a good iron to decrease the amount of damage you're doing to your hair. I use ghd Curve Classic Curling Iron thanks to my hubby, Jake, spoiling me for my birthday. For a fun night on the town or a special event, I LOVE false lashes. Maybe it's the dancer in me, but I really feel like they can take your makeup look of choice to the next level. Extra bonus if you can find someone to help you put on individual lashes instead of the strip lashes! You're a National Marketing Director for the Juice Plus+ Company, a speaker, a choreographer and an entrepreneur — how do you manage to do it all? When you love what you do, work is never work. I am so proud of our Health Made Simple PROS and the life Jake and I have created for ourselves. I passionately encourage people to be brave with their lives. Follow your dreams and make sure you are living the life you deserve. It's never too late to make changes, reinvent yourself with a new career, or just take a second to breathe in this beautiful life we have been gifted. I strive to live in the moment with gratitude, positivity and resilience every single day. That's how I do it all. Does food play a role in your beauty routine? Absolutely. The more clean, whole plant foods you consume, the more beautiful you will be on the inside, and therefore, on the outside. Don't believe me? Check the science. I eat 100% plant-based and the majority of my calories come from fruits, vegetables, whole gluten-free grains and healthy plant food fats. I make a smoothie every morning for breakfast using JP+ Complete Smoothie Mix and I fill in the gaps with Juice Plus+ whole food concentrates. I also grow a Tower Garden on my patio in Brentwood so I have an organic farmers market right at my fingertips. I even use Urban Oreganics face masks with real ingredients like green tea and turmeric to amp up the number of antioxidants I am absorbing into my body. I love helping women find joy in a healthy lifestyle rather than turning to trendy, celebrity-endorsed, roller coaster diets. True beauty radiates from a smiling, healthy, confident woman who is dedicated and deeply connected to her mission in life. What's the message here? Eat your veggies, get a healthy dose of sunshine, laugh more, and love yourself. Do you have a regular fitness routine? I make sure I sweat once a day, even if it's just a quick walk in the sunshine. My favorite way to get my fit on will always be dancing, however I'm a huge fan of Orangetheory Fitness classes and Corepower Yoga Sculpt classes. I alternate between the two studios on days when I'm not dancing, teaching or choreographing a ton, and I swear I've never felt stronger. Developing true fitness and healthy plant powered muscles that sustain optimal health for the long term is critical to feeling the best you can feel. Make it fun, change up your routine, and remember that great abs are developed in the kitchen so exercise is just one piece of the puzzle. What's currently on your workout playlist? If I'm going for a run, it's country music all the way. I'm a born and raised southern girl, even though I live in Los Angeles and there's just something about running to "Wagon Wheel" by Darius Rucker and "Cruise" by Florida Georgia Line that makes me smile and forget how painful running can be. I'm also a huge fan of pump-up rap and pop music while I workout, and Orangetheory and Corepower do a great job of connecting the power of music to the hard work we are putting in. How do you destress at the end of the day? I love what I do so much I could literally work every second of every day and never even realize it so I definitely have to cut myself off. I love cuddling up with my husband Jake, burning a lavender candle or a Capri Blue Volcano candle, and reading or watching something that either makes me laugh or helps me grow as a person and a leader. Because of my oily skin and active lifestyle, I have to be very careful with my skin. To avoid breakouts, I take off my eye makeup with coconut oil, wash my face with ClarityMD Deep Pore Cleanser, and then follow up with the same toner and moisturizer I use in the morning. I also love rubbing some lavender essential oil on my wrists and neck. When I'm with my husband and family sitting on the deck of our family's vacation home Magic View Villa in St. John looking out over the beautiful Caribbean sea as the sun is setting. I am usually feeling grateful, tan, healthy, relaxed and at peace with whatever season of life we are in. Simple and healthy. You are what you eat and life is too short to make looking and feeling amazing too complicated. Besides, anyone will radiate beauty if they walk through life with love in their heart and a smile on their face. The real trick is to cast that shining light onto others who need it more. I will always feel the most beautiful when I am helping others see the beauty in themselves. Be sure to follow Jenna on Instagram! Check back next week for the latest installment of 52 Faces, a weekly series that spotlights a real woman's beauty routine. Last week, food industry insider Aly Holmes shared her beauty routine, including a surprising mascara trick and the splurge-worthy serum she swears by for glowy skin.